The Goal is a novel, which tells the story of Alex, a plant manager somewhere in the USA. 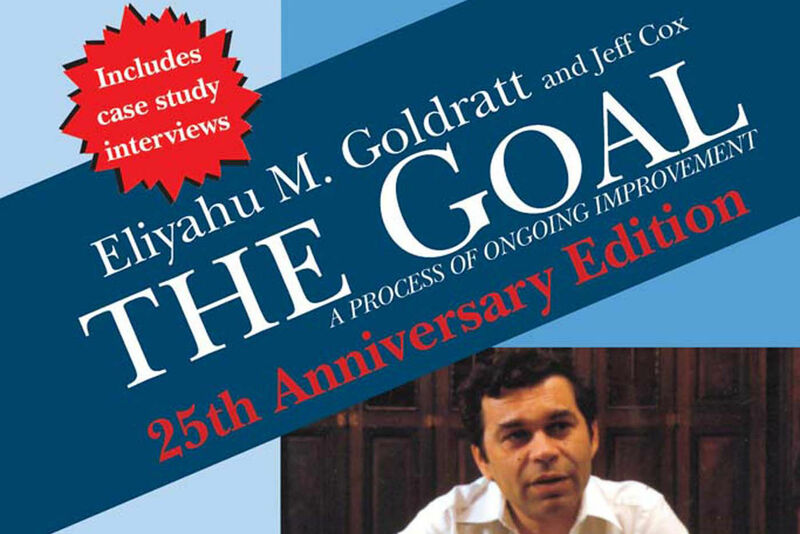 And through Alex, the author (Goldratt) shows us how to apply the Theory of Constraints to an organisation and increase its productivity. In the begging of the story Alex’s plant is suffering major losses and he is told that it may have to shut down. However to battle this Alex needs to understand the problems that the plant is facing, aside from the obvious late shipments and loss of revenue. He accidentally bumps into his university professor (Jonah), who, as we find out later on, is a specialist in TOC, so he is able to guide Alex through the process of changing the daily operations of the plant and battle the dreadful situation that it is in. What makes the story interesting is that Jonah is very intelligent and does not give Alex all the answers on a silver platter, he makes Alex think about the reasons behind curtains events, and guides his thoughts towards the right answers, thus making Alex realise the importance of the concepts and willing to undertake change*. “Alex, if I simply told you what to do, ultimately you would fail. You have to gain the understanding for yourself in order to make the rules work,’’ Jonah says. * Change is probably the hardest thing for us humans. We despise it, we fight it, we avoid it, and we definitely do not wilfully undertake it when someone tells us to. That is why it is of great importance that the person themselves realise the need for change, and want to change things around them in order to achieve their goals. Anyway back to the book. If you interested in reading the book, I would highly recommend that you stop reading right here as the next paragraphs will contain spoilers and will do the exact opposite of what Jonah did to Alex – give all the answers on a silver platter. The first question Jonah asks is: What is the goal? It is very important to understand what the desired effect or outcome of any action is. As a business what do we want to achieve? By doing this particular thing, what is the purpose? This concept can apply to anything from waking up in the morning, to running a multi million dollar organisation. Throughput – the rate at which the system generates money through sales. Inventory – all the money that the system has invested in purchasing things which it intends to sell. Operational expense – all the money the system spends in order to turn inventory into throughput. The next important concept to understand is capacity. Each resource in a system, or operation has a capacity, which is usually measured in time. “The tendency for most managers is to trim capacity wherever they can, so no resource is idle” – Jonah. It is essential to manage capacity and to have an imbalanced system, which would work well with ‘dependant events‘ and ‘statistical fluctuations‘. In production, managing the above mentioned phenomenon is key to achieving the goal. And I think that the methods of managing these can be applied to effectively anything where those two phenomenon occur, be it a university assignment, or you cooking a number of large dishes for christmas dinner, the means to achieve the goal don’t change. It would be hard to explain exactly why the system would fail if dependant events and statistical fluctuations occur without a visual guide, so here is a small article with a video to better explain it (even though the solution in that video is not exactly what we are looking for, but its still good). If you want to get the full understanding, read The Goal. So we can see that if there are just small fluctuations, all the dependant events stall. Even if the first point in the system manages to catch up and go over what they could initially, that doesn’t increase the capacity of the next link, thus limiting it to its own capacity and falling behind or materials. As Goldratt explained in The Goal, these limitations in capacity of a resource are called constraints. A resource is considered a constraint if its capacity is limited and it is a required link in the chain of production. So if a person, machine, event must happen in order for the whole operation to reach the goal, and that thing is bound by a measurement – be it time, energy, speed, etc, then it needs to be examined, as it right there is the sole reason why the operation is being unproductive. In other words: the capacity of a constraint is the capacity of the whole system. Everything is dependant on it, and without it nothing can proceed, thats why it solely determines the capacity of the whole operation, no matter how much better all the other processes are. This also then means that all the other processes, aside from the bottlenecks (the constraints) do not need to be working 100% of the time, they can not add any productivity to the system since all their work will still be dependant on the capacity constrained resources.